Obituary for Valerie "Joy" Johnson | Rhoney Funeral Home, Inc.
Valerie "Joy" Johnson, 78, passed peacefully early Tuesday morning, surrounded by family, at Niagara Falls Memorial Medical Center. Valerie, better known as “Joy”, was born to the late Marcia Crawford on September 1, 1940 in Ohsweken, ON, Canada where she was raised by family on the Six Nations Reserve. 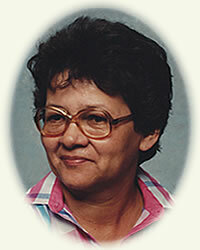 Joy attended Teacher’s College in Ontario and taught briefly on the Six Nations Reserve before relocating to Niagara Falls, N.Y. in the late 1960's where she raised her family and worked at the DiCamillo Bakery for almost 40 years. Joy was an avid bingo and Yahtzee player, loved watching her soap operas and tennis, doing puzzles, reading novels, and listening to country music. Most of all, she loved being surrounded by her big family. Joy is predeceased by her husband Allan “Hank” Johnson, son Allan “Boo” Johnson, and special friends Verla “Terry” Farnham and Elsie Lickers. She is survived by her children Teresa (Todd) Thomas, Lisa Antone, Wanda Johnson, Martin Johnson (Jennifer), Karen Johnson (Michael) as well as 21 grandchildren, 22 great-grandchildren and several beloved cousins and loved ones.